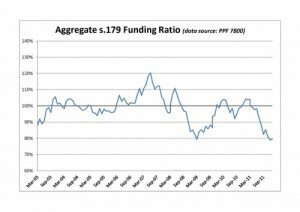 The Pension Protection Fund produces a monthly index update (the February 2012 release has data taken as at 31 January 2012) of the estimated funding position of the defined benefit schemes which would be potentially eligible for entry into the Fund. 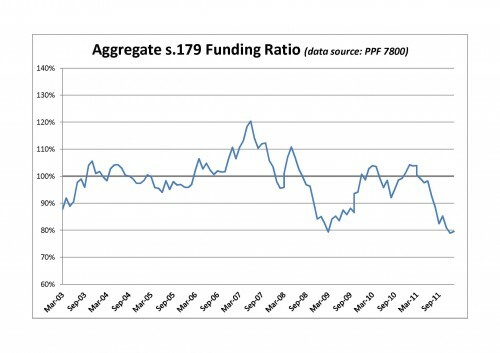 It is worth noting that s179 deficits are calculated with reference to eligible benefits on entry to the PPF (approximately: 100% of pensions already in payment and 90% of accrual for members below pensionable age, subject to a compensation cap), and so would likely be lower than a deficit calculated on a full buyout basis. The backdrop to this was change over the month was muted activity in gilt yields between the end of December and January which limited changes in underlying liabilities whilst equity markets (and growth-seeking assets more broadly) staged an early-year bounce.